Sterling City Hall is located at 421 North 4th Street, Sterling, CO 80751; phone: 970-522-9700. Photo: W.C. Harris House, ca. 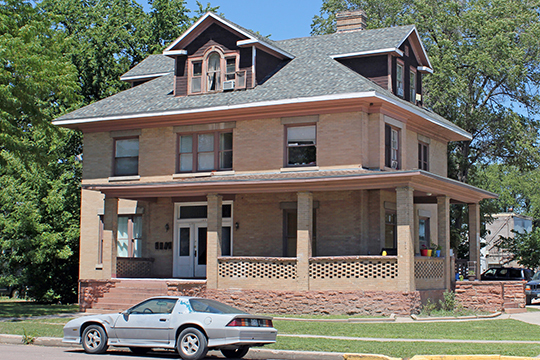 1912, 102 Taylor Street, Sterling, CO. Listed on the National Register of Historic Places in 1984. Photographed by user:Jeffrey Beall (own work), 2007, [cc-by-3.0 (creativecommons.org/licenses/by/3.0)], via Wikimedia Commons, accessed June, 2015. The town of Sterling was originally founded in 1874 by a group of settlers from Tennessee and Mississippi, who were dissatisfied with conditions in the reconstructed South. The first town, constructed primarily of adobe and sod, was located roughly three and a half miles northeast of the present town of Sterling, which was platted in 1881 when the Union Pacific Railroad built its line along the Platte River. Incorporated in 1884, Sterling is the County Seat of Logan County, and with just under 14,000 citizens, it is Colorado's most populous city east of the Front Range. Throughout its history, Sterling has been Colorado's most populous community northeast of the Front Range. It is the largest city between Denver, 130 miles to the southwest, and North Platte, Nebraska, 140 miles to the northeast. As such, Sterling has long served as the regional commercial center for northeastern Colorado as well as for the lower panhandle of Nebraska. Sterling's early economic growth was primarily due to its founding as a railroad town, at a key junction of the Union Pacific (U. P.) and Chicago Burlington and Quincy (CB & Q) lines. The U. P. line from LaSalle (south of Greeley) to Julesburg was completed in 1881, and not coincidentally Sterling's original townsite along the route was platted that same year. Completed six years later, the CB & Q line from Cheyenne, Wyoming, to Holdrege, Nebraska, intersected the U.P. line at Sterling, further assuring the town's future as an important rail center. The railroad brought new settlers as well as lumber, other building supplies, and general merchandise, all of which enabled the town's growth and cemented its role as the region's commercial hub. Sterling's designation, in 1887, as the county seat of newly-formed Logan County created a sense of permanence, led to the construction of the town's first public buildings, and helped attract an ever more stable citizenry. Finally the construction of a Great Western Sugar factory at Sterling in 1905, promoted new agricultural practices, spawned other industries, and ushered in a new era of prosperity. Paul R. Secord, Vice President and H. James Kolva, Beland Associated, Inc., Sterling Post Office, Federal Building and Federal Courthouse, Logan County, CO, nomination document, 1985, National Park Service, National Register of Historic Places, Washington, D.C.
Carl McWilliams, Cultural Resource Historians, Downtown Sterling Historic District, Logan County, Colorado, nomination document, 2013, National Park Service, National Register of Historic Places, Washington, D.C.